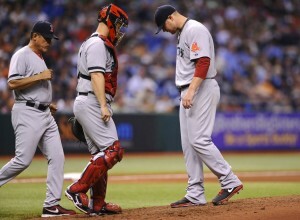 Boston Red Sox left-hander Jon Lester gave up three home runs, seven walks in seven runs in 4 2/3 innings of work last night against the Tampa Bay Rays at Tropicana Field. Lester is mired in a five start slump and is 0-3 with a 6.90 ERA over 30 innings. Lester opened the season 6-0 with a 2.72 ERA, so it comes as no surprise when Lester offered up a self-evaluation after the Red Sox loss. According to Red Sox manager John Farrell the issue is mechanical and Lester is unable to repeat his delivery, making location and command impossible. Lester isn’t having any trouble with location in between starts with his bullpens.